The historic town of Carcassonne is in the Languedoc-Roussillon region, 90 kilometres south-east of Toulouse. It is certainly one of the most interesting and impressive medieval towns in the whole of France, and the town has a history dating back to the Cathar Wars, in which the town played a very important role. 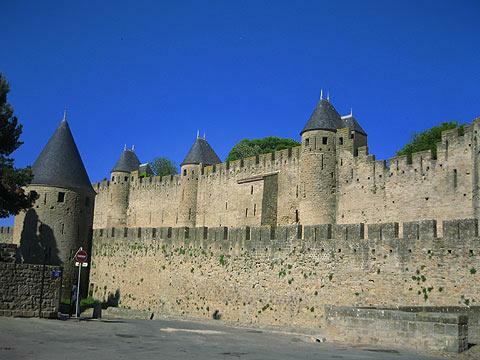 Carcassonne is divided into the fortified Cité de Carcassonne and the more extensive lower city, the ville basse. 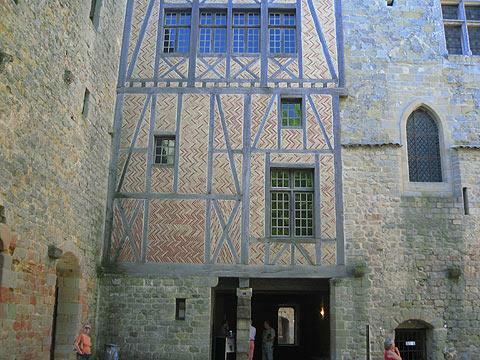 It is the Cité de Carcassonne that is of interest to visitors. France This Way comment: for a really good look around, try to avoid the high season. 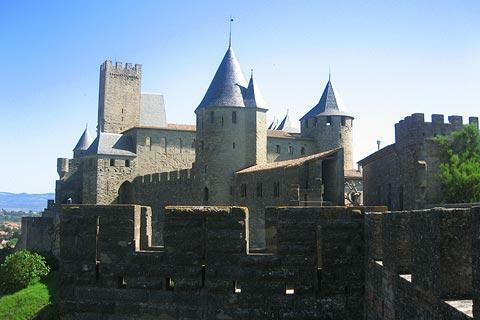 The winter months can be an excellent time to visit Carcassonne. The major sites are quieter, the weather, which can be unpleasantly hot in summer, is more conducive to sight-seeing and the town is still lively, especially around Christmas time, when there is a Christmas market and an artificial ice rink. The medieval town in Carcassonne was originally a collection of ramshackle buildings huddled around a fortified castle, known as La Cité. By the 19th century it had become dilapidated, but was then restored to once again be the remarkable medieval town we see today. The fortress was added to the UNESCO list of World Heritage Sites in 1997, and is also a listed National Monument of France. Start your visit at the Pont Vieux (Old Bridge) which crosses the River Aude, and was the original entry road to La Cite, the medieval walled town that has witnessed so much of the Languedoc's bloody history. This crossing gives the visitor one of the best views of the city, so have your cameras at the ready! From the outside, and some would say from the inside too, its towers and slate roofs make La Cité look as if it's been transported from a storeroom on the Disney film lot. This is somewhat unfair, but the walls which enclose the Cite were extensively restored in a massive programme of rebuilding which began in 1844, and this does account for its pristine, built-yesterday appearance. 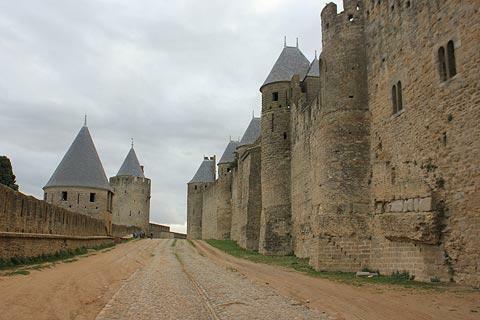 The restoration of Carcassonne has come in for some critisism because the restoration attempted to adhere to its original 13th century appearance but was based on insufficient information and a rather idealised view of history. To some visitors it may still seem too much like a film set while to the other 99%, who are not experts in medieval architecture, it is an amazing experience! The Pont Vieux takes you onto the Rue Trivalle, a narrow lane lined with ancient houses, some which are now restaurants and antique shops. From there it's a short walk to the Porte Narbonnaise, the main entrance to La Cité. Once inside Carcassonne old town you are treated to a maze of winding, cobbled streets, and lots of wide-eyed tourists: la Cite is lissted as a World Heritage Site status and it is one of the most-visited sites in Southern France. As a result it is without doubt over-commercialised, with gift shops selling the usual selection of postcards, tea cloths and guidebooks, but there are some chic boutiques, and dozens of restaurants catering for all budgets. 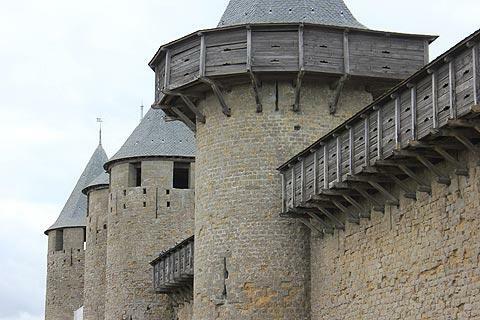 There are 52 towers and two miles of double, concentric walls encircling this unique fortification. 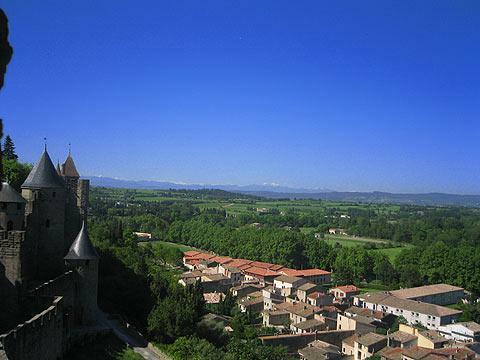 A walk along the battlements provides wonderful views of the town of Carcassonne and the flat plains of the Languedoc. There was a religious building on this site at the time of the Visigoths, but it was continously re-designed through the centuries, until in the 13th century the present-day building was created by demolishing all but the crypt and the nave of the original church. Consequently a large part of the 16 metre wide nave is authentically Roman style. In 1801 the Basilica was replaced as the city's cathedral by the 13th century church of Saint Michel. Both buildings are open to the public but the Cathedral of St Michel does not have the historical interest of the Basilica. The organ in the Basilica is the oldest in France, and has been expertly restored to it's former glory. 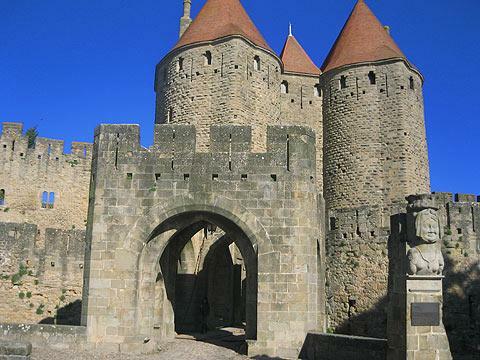 Positioned at the heart of the Cité, the Comtal Chateau of Carcassonne is now used as an information office, from which guided tours can be booked, and there is an extensive museum of artifacts excavated over the years. This is well worth a visit as it provides tangible, intriguing evidence of the former inhabitants. 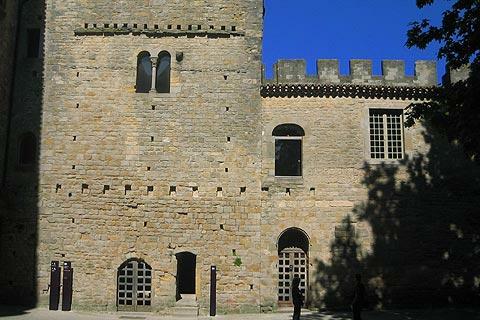 The Chateau was built in the XIIth century by the Trencavels, who were the ruling family in the fortification for two centuries, and supporters of the Cathars. This unfortunately brought them into direct conflict with Simon de Montfort and the Knights Templar, and their eventual demise. In 795 The Emperor Charlemagne besieged the city. After a siege lasting for five years, the citizens were down to their last bag of corn and a small pig. Dame Carcass, a Saracen princess who had taken over the running of the city after the death of her husband, ordered the precious bag of corn to be fed to the pig, which was then tossed over the ramparts. When it burst, after hitting the ground at high speed, the Charlemagne army was fooled into thinking there must be plenty of food left for the citizens if they could afford to feed a pig, and then throw it away. Deciding the siege was a lost cause, Charlemagne retreated and life for La Cite returned to normal, thanks to the ingenuity of their female leader. A rather unflattering bust of the noble lady, commissioned in the eighteenth century, adorns one of the pillars of the Porte Narbonnais. She certainly looks "formidable" enough to have taken on the Emperor Charlemagne. It's a nice yarn, probably a complete fantasy, but in keeping with the whole La Cite story. It is true that most visitors do not stay to visit the nearby new town of the same name. Today, the new town in Carcassonne is a compact multi-ethnic place, built on a grid system, which makes sightseeing easy. At the hub of this grid is the elegant Place Carnot. This is where everyone who is anyone hangs out on Saturday mornings. The market vibrates with life and colour, with stalls selling everything from artichokes to zucchini. There is a thriving Moroccan population around Carcassonne, and the Place Carnot market is where they congregate to buy huge bunches of fresh coriander, and aromatic spices for tagines. 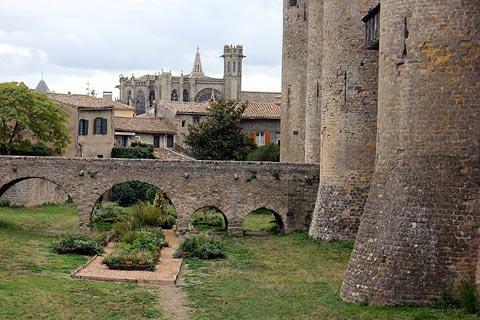 If you can't resist the buzz of a bustling town in the height of the tourist season there is an excellent programme of events in the summer at Carcassonne. The highlight is the famous Bastille Day (July 14th) firework display. This is the traditional French way of commemorating the storming of the Paris Bastille on July 14th 1789, which signaled the start of the French Revolution. Arguably the biggest display outside Paris, the setting is certainly unrivalled for breath-taking spectacle. The fireworks are released from the ramparts of La Cité, culminating in a stunning son-et-lumiere display, in which the whole city seems to be blazing from end to end. A fitting salute to a city which has seen more than its fair share of trial and tribulation. The Bastille Day pyrotechnics were inaugurated in Carcassonne in 1998 and now attract a great deal of spectators so if you want a good view get there early, very early. The display starts at 10.30 pm, but if you have a car be there at least three hours beforehand, and park up in one of the many laybys which overlook the city. Do as the French do - take a picnic and make a night of it. You will be in for a memorable experience. Many visitors are in the region to explore the fascinating history of the region: a good starting point is to visit some of the Cathar castles nearby. 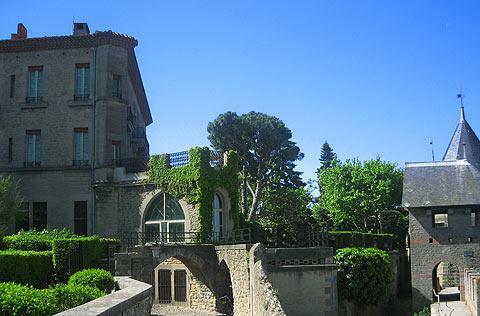 An interesting route to the north-west of Carcassonne takes you to the edges of the Regional Natural Park of Haut-Languedoc and villages such as Revel, Saissac and Soreze. To the south-east towards Narbonne you can visit the pretty village of Lagrasse.